Riveting. Once again, Greg Rucka has turned in a comics project that is absolutely riveting. I admit, I had my doubts about Superman: Ruin Revealed , coming off the somewhat lackluster Superman: The Journey and the earlier parts of the Ruin triology. But though this trade had its slight drawbacks--I don't think the constant Infinite Crisis interruptions really did it any favors--the final two issues are pure Superman magic, and deserve their place among the echelon of great Superman stories. It's about the time we realize a beaten, power-drained Superman is going to have to be faster than a speeding bullet to keep a revenge-mad cop from killing Pete Ross that I realized I could not take my eyes away from the page. In the climax of Ruin Revealed , Greg Rucka is creating conflict on so many levels, and bringing so many stories together--from Lana and Pete to Lupe Leocadio, to Superman and Ruin and Mr. Mxyzptlk--that the strands of the story are almost like a symphony playing. There's so much of the build-up of this story that I didn't like--Ruin's fanatical, out-of-nowhere obsession with Superman, Mxyzptlk's annoying interruptions of the story, Lana and Pete's conflict--that it's amazing how well Rucka turns it all around; Mxyzptlk's exit appearance, much of it told in black-and-white, is done especially well. And, most importantly, Rucka makes the story relevant to the Superman mythos itself, bringing the climax down to speeding bullets and the definition of heroism. I also liked how Rucka brought three of his supporting characters together at the climax of the story, in one last pre-Infinite Crisis hurrah. 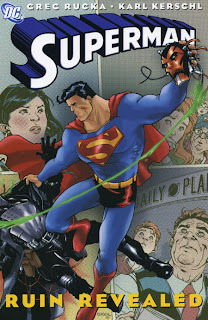 Throughout Rucka's Adventures of Superman run, almost separate from the main story, Lois Lane has hunted the sniper who shot her in the Middle East. The leads she follows brings her to Jonah McCarthy, former of Rucka's Wonder Woman run, revealed to be a secret agent for Maxwell Lord's Checkmate. Under duress, McCarthy reveals that the sniper Lord used was Sasha Bordeaux, of Rucka's Detective Comics and The OMAC Project stories. As such, we now have Batman's former bodyguard shooting Superman's wife, under the direction of one of Wonder Woman's former employees. I felt that the fact that Rucka has Lois leave Sasha not with understanding, but with threats of vengeance, was a fantastic lead-in to the Big Three's conflicts in Infinite Crisis --the wounds run so deep that even their supporting casts find themselves in conflict. Lois's role in the Ruin trilogy didn't always work for me, but this conclusion was imminently satisfying. If anything, this trade falters only in the weaving of Infinite Crisis. The trade starts with two great chapters of Clark trying to prove Pete Ross's innocence, and then the trade jumps to leave room for Superman: Sacrifice . When it returns, Superman goes off on an adventure with Zatanna tied in to JLA: Crisis of Conscience , then finally returns to hunt Ruin--only to be drawn away again by the explosion of the JLA Watchtower. Finally, the story hurdles towards its conclusion, but the path can't help but feel a little wobbly. It's hindered too by wide variety of artists, though main artist Karl Kerschl, who's work took a little getting used to when he started early the year before, ultimately offers great stuff here. Well, with that jolt of fresh air, I'm on now to Superman: Sacrifice , and I'll see how that holds up. From there, Wonder Woman: Mission's End and more as we complete our review of the Infinite Crisis crossover trades.